Insulation and ventilation work together to keep your home operating at peak efficiency. Attic ventilation is an essential part of roofing. Besides extending the life of the roof, proper ventilation minimizes the difference in temperature between the attic and outside. Ventilation removes moisture and heat from the attic. In an improperly ventilated attic, this moisture and heat raises energy costs, creates ice dams, and damages roof system components. Condensation (created by daily household activities that involve water) forms inside attics. If not properly ventilated, this condensation can become bad enough to be confused with a roof leak. Moisture can cause plywood rafters and roof decks to warp or deteriorate. They often become spongy and dangerous to walk on. The adhesives used to bond the plywood also deteriorate and rot due to the excess moisture. Condensation can cause metal to rust. Nail heads can rust off causing a great deal of structural damage. Metal plumbing and HVAC straps can rust and break, causing ductwork to crash down into the ceiling. These problems are more common in humid climates. In cold weather, high levels of humidity in the attic can cause frost to form on the roof deck. This often leads to dry rot. Excess moisture becomes trapped in the insulation. This creates an environment where mold, mildew, spores, and fungi can freely propagate. Cooling units need to be serviced or replaced due to overuse. Ice dams (the result of melting snow freezing at the roof edges) form frequently. They start going under the shingles and begin to cause leaks. 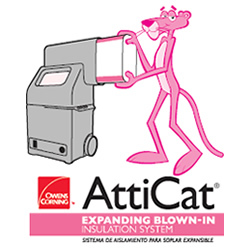 Putting insulation in your attic is made easy with the AttiCat Expanding Blown-In Insulation System. Fiberglas insulation is broken up and fluffed to add millions of tiny air pockets which gives the material even more insulation power. The insulation is easily placed into the attic with a hose. 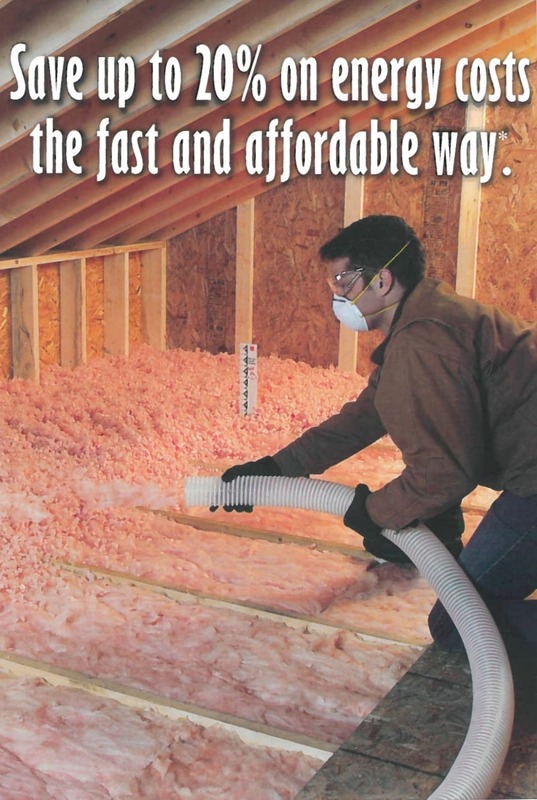 This insulation does not settle and will save you money on energy costs for years to come. For a 1,000 sq. ft. attic, it should take less than 1.5 hours to blow the insulation. The entire job can be completed in less than 4 hours. The system is self-feeding and puts the insulation exactly where you want it. Fiberglas insulation expands and releases inside the machine, with minimal dust. No other cleanup is necessary. The fully enclosed system requires only minimal handling. The hose is controlled with a remote control. Call or visit for a free estimate on home insulation and lower energy costs.